With July 4th less than a week away, I’ve been on a major cookout food kick. Shrimp cocktail is a usual selection at our family get-togethers, so when there was a sale on raw, jumbo shrimp at Whole Foods last weekend I jumped at the chance to experiment. I’d come across a recipe for roasted shrimp cocktail in Barefoot Contessa Back to Basics a while back, and as a true believer in the flavor-improving ability of roasting, I was all for trying the method out. Lo and behold, it works wonders on shrimp. Maybe they were just fresher than most pre-cooked, straight-from-the-freezer varieties, but the usual crustaceaniness fishiness wasn’t there. Plus, they were firm (but not overcooked) and not at all soggy. So many advantages AND a zesty, homemade cocktail sauce (albeit one made with a smorgasbord of jarred ingredients)?! Maybe one of these days the shrimp cocktail preparation torch (’cause there is such a thing) will be passed to me. Until then, I’ll gladly throw this recipe together as a savory, mid-week indulgence. Stir together cocktail sauce ingredients in a small bowl, set aside. DO AHEAD: Can be made up to a week in advance. Store in a covered bowl or jar in the fridge. Position oven rack on center level, preheat to 450°F. Rinse and pat dry shrimp. 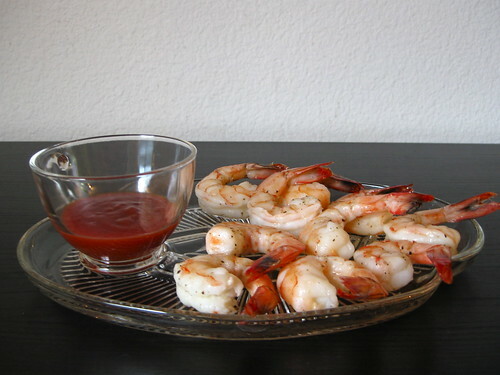 Transfer shrimp to a small, rimmed baking sheet (about 10″ x 15″). Drizzle with oil (just enough to lightly coat) and toss with a pinch or two of salt and pepper. Arrange in a single layer. Roast in the preheated oven for 5-6 minutes or until pink and firm to the touch. Remove to a serving plate to cool before serving with cocktail sauce. ¹ I like Whole Foods 365 Organic (or conventional) Ketchup, it’s more tomato-y than most. Heinz Organic is also a good choice for an easier-to-find store brand. Cooking Light Magazine weighs in on this here: http://www.cookinglight.com/cooking-101/essential-ingredients/best-ketchups-00412000067694/. ² Peeling and deveining shrimp is not difficult, but probably not the best activity those who tend to be squeamish. Feel free to sub pre-peeled and deveined raw shrimp. The 18/20 refers to the number (count) of shrimp per pound. If you use smaller shrimp (say 31/35, which is usually labeled medium), expect the cooking time to be a several minutes less.